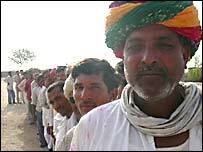 Enthusiastic voters queued up, beating the bright desert sun in the village of Guda Bishnoi, about 20km from the historic city of Jodhpur. 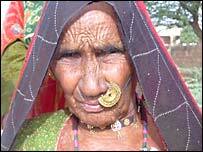 The area is dominated by the Bishnoi community which is known for its love of nature. The strength of this became clear in 1998 when villagers launched violent protests against Bollywood star Salman Khan, accusing him of killing two endangered antelopes. The community survives on agriculture and animal rearing. Although the people here are largely illiterate, they are extremely conscious of their political rights, which is why almost the entire village has come to the polling booth. "This village is a voting machine," said Ajay Singh, a local resident. "Some of my village folks lined up at the polling centre two hours before voting was scheduled to begin", he said. Part of their enthusiasm stems from the fact that the sitting MP and a candidate of the state's governing Bharatiya Janata Party - Jaswant Singh - is a Bishnoi and belongs to this very village. His main challenger is Badriram Jakhar of the Congress Party. Scarcity of water is the main problem in this area which falls in the depth of the great Indian Thar desert. Arjun Ram, who is 75 and had been the village headman for 13 years, says water supply is restricted to only two days in a month. "Village folks are at the mercy of Gods," he said. "And even they have not been kind enough to us as rains have failed this village for a third year in a row," he said. "I know my vote won't change anything here. It will only ensure a cushy five years in power for the winner", Arjun Ram said. Ghamdi Ram, who has voted in the last five elections, says politicians don't do enough, but is slightly more optimistic that things will change. Kaisi is 80 and says voting with the electronic voting machine is fun. "You press the button and the vote is fixed." "The machine leaves no scope for cheating," she said. And has she heard of India Shining, the government-sponsored advertising campaign highlighting its achievements? "India may be shining in cities, but villages are as dark as ever."